Fans were treated to a great night of boxing on HBO on Saturday as “Dazzling” Darren Barker wrestled the IBF Middleweight title from former champion Daniel “Real Deal” Geale. Most ringside observers and fans, (not including HBO’s unofficial scorer and boxing judge Barbara Perez), had the fight scored extremely close, as each fighter gave as much as they took in this nip and tuck affair. Geale predictably had a strong beginning to the fight and controlled the pace and distance. As the fight progressed, Barker came to life by manufacturing a body assault in an attempt to reduce Geale’s output. By the fourth round Barker appeared to have flashes of momentum, but suffered a cut above his eye and some bruising for his troubles. This was a tough fight to score, especially the mid-rounds where one could make a case to score for either combatant. However, in round six Geale landed a vicious left hook to Barker’s ribs and Darren went down in agonizing pain. Amazingly, Barker recovered and was up at the count of nine. He survived the knockdown and the round to the surprise of many, most notably Daniel Geale. Maybe even more astonishing is the fact that Geale seemed to let Barker off the hook on the 7th round. Barker came back to win the 7th convincingly. I’m still shocked that he recuperated from the body shot. Rounds 8 – 10 are where many predicted Geale would take over and wear Barker down. Someone forgot to tell Darren as he delivered some of his best work in those rounds. As the fight entered the final two rounds, it seemed as if the title was up for grabs- at least on my scorecard. I thought that Daniel Geale clearly won the 11th and 12th rounds. He landed the cleaner punches and controlled the action more than Barker. The judges disagreed as two awarded Barker the 12th and all three gave Barker the 11th. Here is where I have a problem with the judging. Judge Perez scored the fight 116-111 for Darren Barker. That is equivalent to 8 rounds to 3. Don’t forget, Geale had a 10-8 round in the 6th. No way! On the flip side, Perez was the only judge to give Geale the 12th round, while judges Carlos Ortiz and Alan Rubenstein awarded the final round to Barker. I agree that 114-113 either way is fine. However, I think the intricate idiosyncrasies within each judges’ scorecard left a most malodorous air inside of the Revel Casino. 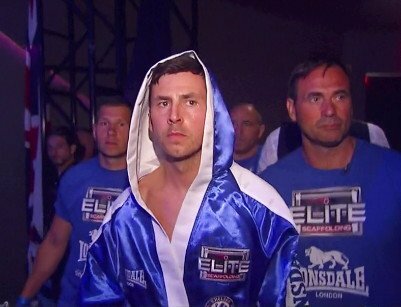 Congratulations to Darren Barker on winning the IBF Middleweight championship. I applaud both guys for giving us an exciting fight. And speaking of exciting fights…. Another IBF title changed hands on Saturday night as Kiko “La Sensacion” Martinez scored a sixth round stoppage of Jhonatan “Momo” Romero. With the victory, Martinez claimed the IBF Super Bantamweight strap. Martinez attacked Romero from the start and would not let up on his assault. Each time Romero tried to get distance to fight back, Martinez would smother him and drive him back to the ropes. A shot to the head seemed to put Romero on unsteady legs and he began to retreat. Martinez gave chase and continued to pressure and score with big shots to the head. In the second frame, Romero began to utilize movement while Martinez continued to apply pressure. The same can be said for the next couple of rounds, as Martinez threw at a pace that would make Joe Calzaghe and Antonio Margarito blush with envy. A clash of heads drew blood from Romero and it only intensified Martinez’s production. Martinez was chasing and throwing at a rate in which I thought he would eventually tire and run out of gas. Martinez was stopped earlier in the year by Carl Frampton. To his credit, however, Martinez kept coming…. and coming, and, coming, and coming. It paid off in the sixth round as Martinez landed a big right on Romero’s head. Once again, Romero backpedalled and Martinez stalked and sized him up. Martinez cornered Romero and threw multiple shots, causing the referee to stop the bout. The key when showing young fighters a tape of this fight is to stress activity- not only throughout the fight, but also when your opponent is in trouble. The referee, in my opinion was a bit premature in stopping this fight. If you watch the replay, you’ll discover that most of the follow-up shots by Martinez missed or were blocked by Romero. However, the lesson Martinez taught us is to keep punching no matter what. Premature stoppage or not, the referee jumped in and Kiko Martinez is the IBF Super bantamweight champion! By fight time, he may have been as much as a +450 underdog, which is HUGE for boxing. In other words ladies and gentlemen, a $100 bet would’ve earned you a $450 profit. Romero was -500, which means if you bet $100 and Romero won, you’d win $20 in profit. A very solid night of fights. Stay tuned for a loaded remainder of 2013, where we will see names such as Abner Mares, Leo Santa Cruz, Bernard Hopkins, Floyd Mayweather Jr, Saul Alvarez, Miguel Cotto, Nonito Donaire, Vic Darchinyan, Manny Pacquiao, Brandon Rios, Danny Garcia, Lucas Matthysse, Adrien Broner, Marcos Maidana, David Haye, Tyson Fury, Timothy Bradley, Juan Manuel Marquez, Mike Alvarado, Ruslan Provodnikov, Wladimir Klitschko, Adonis Stevenson, Tavoris Cloud, Seth Mitchell, Chris Arreola, and more. Boxing is dead, huh? Uhh hello James Kirkland and Victor Ortiz? Can we add your names to the list?